- 3 black and 3 red 4-mm wires. All elements make use of 4-mm sockets. Actuators (motor, buzzer and lamps) can be connected to the control outputs of CoachLab II/II+. 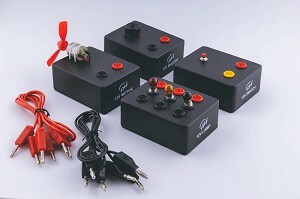 The push button can be used as a digital sensor and can be connected to the inputs of the interface. For BT inputs the CMA adapter (art. Nr 0519)1 should be used. Technical specifications of the Actuator set are described in its User's guide.